I was summoned to the office of Associate Director Morrell and had been sitting in the office antechamber for an unusually long time. The room was plain, even by human standards, and small; its bare metal walls broken only by two doorways, one that led into the office and the other into an adjoining hall. Someone had laid a pile of framed artwork against one wall, but if the thick layer of dust was any indication, they would be there for a while yet. Although, I was not alone in the small antechamber, I might as well have been. A human female sat across from me, staring intently down at her datapad; I felt that she was trying to avoid looking at me. Sitting far back in the chair so that my tail fell through the opening in the back, my feet dangled well above the floor. I have often seen human children sit like this and will admit that I am not fond of the comparison that many humans feel compelled to make; it was probably better for both of us that this female ignored my presence. Not for the first time, I wondered at my decision to leave Aessa and join this organization. Stories of the lawless human territory called FreeSpace had long intrigued me and when I read of the undermanned group of heroes attempting to bring order to this pirate infested chaos, my course seemed clear. I would like to say that I was the first Razi to join the FreeSpace Marshals, but that would be inaccurate, there were two before me. The degree of prejudice that these humans were capable was not included in my decision to come to this part of the galaxy, had it been I might not have left my homeworld. Although no race is spared their prejudices, not even their own, my smaller height and reptilian heritage made me an easy target, and I have found it a struggle to be acknowledged for my position as well as my skills. The one positive thing I can say is that it is possible to win them over, as I have earned the respect of many in this organization. Shouts from behind the door to A.D. Morrell’s office told me that matters were progressing normally. The female that sat across from me must have felt differently as the shouting seemed to cause her distress, and when it inevitably escalated, she stood and departed, managing to do so without even a sideways glance in my direction. I will have to admit, that degree of dedication to ignoring the presence of another being is truly impressive. In the past, when the shouting had reached these levels I was summoned shortly thereafter, so I began to extricate myself from the chair, being careful to avoid scraping the soft scales of my under-tail on the hard wooden frame. Not long ago, I found myself assigned to a partner; a brash and often foolishly brave human whose self-image was as grand as his accomplishments. Bric Braun. As far as human name’s go, his was as much statement as it was a designation, and he never seemed to tire of using it. While most in the organizations identified themselves professionally with the title Marshal, Bric introduced himself by name alone, seeming to expect instant recognition. He was of the opinion that the polished silver badge pinned to the chest of his brown and gold uniform did enough to identify his occupation. This did tend to pose problems in audio communications though. The voice belonged to A.D. Morrell, a singularly grumpy human who seemed to enjoy shouting more than speaking. The first time I’d met him, he was dressing down a young hacker, his bot, and the boy’s superior officer so loudly that his voice cracked. Upon entering the office, I found Bric and A.D. Morrell standing on opposite sides of a huge wooden desk; how the A.D. managed to get a desk made of wood onto this space station was a mystery I never did solve. The metal walls of the office were decorated with a variety of firearms, most of them long ago outlawed by the Galactic Tribunal. On the desk between them sat a broken shockfoil, a vicious weapon often carried by pirate captains. A.D. Morrell was breathing heavily, both of his hands were flat on his desk and his face was a shade of red that resembled a plasma fire. Opposite him, Bric stood erect with his arms folded over his chest, a look of defiance writ across his face. It was an uncomfortable situation in which to step. Bric had told me that he wanted to pursue Shileg Tal, the captain of the pirate vessel Marauder. As the leader of a particularly bold group, she was known to operate around Ring Plazas in well-traveled systems, capturing and robbing trade vessels. I decided to reply without commitment. “She is an outlaw whom has evaded many Marshals and should be stopped.” I was not entirely convinced that pursuing her was a good idea, but I also knew that Bric would not be dissuaded. “Exactly the type of criminal that needs to be pursued and captured by Bric Braun,” my partner added, spinning my words to match his agenda while speaking in the third person in a tone far louder and deeper than was his normal. I have noted that he used that tone often when speaking of himself in the third person. A broad grin spread across Bric's features, followed by an animated “Woop!” which I understood to mean that he was happy with my reply. While I heard Bric acknowledge A.D. Morrell’s words, I knew from experience that he had no intention of abiding by these terms. Much against my preference, we regularly pursued and arrested criminals unlawfully in local government space, caused obscene amounts of property damage, and used our weapons to stun bystanders for a variety of reasons. Admittedly, that last concern was the one to which I objected least. My people and our cousins the Hotir had become masters at producing devastating antipersonnel weaponry, including the stringently outlawed grinders, of which A.D. Morrell had three mounted on his office walls, yet I was continually impressed at the efficiency of the sonic blasters developed for the Marshals. These powerful handguns had been specially designed to accurately deliver a concentrated blast of sound tuned to disrupt neural activity in the target without causing physical damage. As part of my training as a Marshal, I was subjected to these blasts on several occasions. Though my reptilian nervous system is more resilient than that of humanoids, even I was rendered temporarily incapacitated after two shots, with a single shot being enough to prevent me from moving some limbs for a short period. Unlike the metal spewing grinders that tend to destroy flesh and bone, these ingenious devices allowed Marshals to capture criminals without loss of life or limb, which is apparently a serious consideration among a people who are unable to regenerate. After a few last instructions from A.D. Morrell, which included threats of suspension and incarceration for even the most minor of infractions, Bric and I left the office to begin our daunting task. “I’m thinking we should head to Falleon Plaza,” Bric suggested as we entered the hangar and started for our craft. “So we don’t let anyone that we want to talk to get off the plaza,” he said, tapping the sonic blaster in its holster. “I must remind you,” I began, certain that my words would be ignored, “that A.D. Morrell was very specific about using our weapons for that type of information gathering." "I think you're taking his words too literally." "Is there another way to take his words?" As I looked up at him, I watched a grin spread across his face. "Think of them as suggestions rather than directives." "I see," I responded doubtfully. We walked a moment in silence before I finally asked. "You do know that firing on innocents is a direct violation of our regulations." Among my people, one either followed the rules or didn't, and then accepted the consequences. Humans in particular seemed to pick and choose which rules they would follow, and would then go to great effort to justify their choices. It was this kind of incoherent logic that so frustrated many of us, and why peace with them was so tenuous. That I had learned to accept this way of thinking and could sometime see the logic in it was nothing short of astonishing; I often wondered if this would make it more difficult for me to reintegrate when I finally returned home. Thirty-three minutes after I belted myself into the specially customized co-pilot chair, we approached the Halo. This magnificent and massive structure had been the source of much dispute in the relatively brief history of FreeSpace. According to the historical records, the mysterious race of beings known as the Suzerain created the Halo to extend their influence across the stars, enslaving an untold number of worlds. Fortunately, no empire stands forever. After their eventual defeat during the Millennium War, the technology fell through the hands of numerous governments before being seized by the Galactic Tribunal, which lead directly to the founding of FreeSpace and our modern era of strained peace. "We're gonna to make our approach," Bric said from the pilot's chair, all of his attention on the control systems. I stared out the cockpit window at the magnificent sight. I never tire of the deceptively simple structure; its immense circle of golden interconnected rings glittering above the accretion disk of the swirling black hole. Delicately balanced at the event horizon, and powered by the immense energy put out by the spatial singularity, each of these rings leads to a different star system, allowing for near instantaneous travel across the galaxy. Lost in that beauty, space stations too numerous to count litter the ergosphere region of the Halo, most acting either as relay points for craft communications or trade and customs ports for the various worlds. A great deal of smuggling takes place among these space stations, and while the Marshals make an effort to patrol and limit this activity, there are simply not enough of us to effectively manage it. As a result, all but the most conspicuous or egregious instances are generally ignored. This was another example of incoherent human logic and I have difficulty accepting this practice; fortunately my partner feels the same. While we have yet to clean it up, criminals do not operate with the same impunity they once had. “This is Bric Braun aboard MPB-2677, requesting permission to enter the Falleon Ring,” he announced in a deep, booming voice over the comm. I activated the transponder that would confirm the identification of the Marshal Patrol Boat. “We are doing well, Connelly,” I replied. This Ring Warden was one of the few humans who immediately accepted my presence and never displayed any prejudice; I counted him among a select group of friends. “Falleon, huh? Are you two going after someone or just looking for information?” he asked. I saw Bric's posture stiffen; this was not a question he wanted to answer. “This system requires more attention than some others,” I replied. While deception is not anymore uncommon among my people than humans, rather than using blatant falsehoods, we mislead. My response was not in itself false, but neither did it answer the question that was queried. Where I found human pheromones difficult to detect and decipher, reading their body language was remarkably easy; Bric more than most. “That makes sense,” he replied to Connelly, visibly relaxing and not trying to disguise the pride in his tone. “Thank you Connelly,” I replied, as Bric aimed our craft toward the ring. While I had a fear of travel through the rings, I still found the dive to be unnerving. Beginning from the holding point just beyond the cluster of space stations, the dive began with the pilot accelerating toward the destination ring, the coordinates of which are fed by the Ring Warden. A little known fact, the Halo rotates opposite the direction of the vortex, changing the coordinates for each successive journey. This is most especially important because missing the destination ring can mean ending up in wrong system at best and plunging into the singularity at worst. At the start of the dive, the rings were indistinguishable, giving the whole of it a solid appearance, but drawing closer it began to appear as tiny links on a circular chain, with the spinning accretion disk dominating the sky. As the strength of the black hole took over the craft's acceleration, the immense size of the Halo began to become apparent, as did the ominous emptiness at the center of the disk. It was difficult at this point to avoid thinking about the many things that could go wrong and lead to disaster. The delicate balance between the rings and the unimaginable forces of gravity beyond it was so finite that nearly any miscalculation is irrecoverable, but such is the risk of instantaneous intergalactic travel. There are theories, but in truth no one will ever know what happened to those who missed entry to a ring destination, as there is nothing known that can resist the crushing effects of such a gravity well. “Thirty seconds to breach,” Bric announced, his hands were wrapped tightly about the flight controls, as if his grip could keep him from falling into the singularity. For ten of the last thirty seconds, it was possible to see the system ring against the backdrop of unbroken blackness that was the singularity. It was at the point where only unbroken blackness could be seen that the full scale of the system ring, and thus the Halo as a whole became apparent. In each journey through the ring, staring at only blackness made it by far the longest twenty seconds I have ever experienced. There was just enough time for doubt and fear to take hold; were the coordinates correct, would the ring fail, was this actually where I wanted to be at this point in my life; the scales on my feet grew warm with anticipation and I began to pant. Bric always counted down the last ten seconds to breach; I believe this was more for his own comfort than mine, though I did appreciate having some sound in the cabin to distract my thoughts. Breaching the ring, for me, felt like a full body hiccup--a singularly unpleasant experience, but over very quickly. “Synchronizing the chronometer,” I said as we emerged from the Lagrange ring, its massive radius matching that of its counterpart in the Halo. The time loss was disquieting, five to fifteen minutes of lost time; it was a discontinuity as yet unexplained. Some people claimed to be aware during this displaced time, existing in a suspended state. I cannot imagine what it must be like to be frozen in time, especially in the rare instances where craft have taken hours or even days to complete the journey through the ring. “It appears we lost eleven minutes, twenty-two seconds,” I reported, though I could see that Bric was not listening, he was completely focused on the Falleon Plaza, searching the scanners for any sign of the Marauder. The Ring Plaza was yet another engineering marvel left behind by the Suzerain. Fifteen kilometers long, three wide, and five high, their primary function was to support the Lagrange rings and act as staging points for invasion. All of the functional rings in the Halo had one of these Ring Plazas, and each was complete with both crew and slave quarters, raw material storage, processing facilities, and repair bays, with only minor variations based on the planetary system. The Plaza in the Taconeus star system, for example, had a section with thousands of small detachable tubular containers clustered around a series of piping, a complex gaseous storage system for the mining operations that took place within the atmospheres of the five local gas giants. “I’m going to put in at the common docks,” Bric said aloud, more to himself than as an attempt to inform me. I was not surprised by this tactic; the common docks were so busy that a patrol boat could easily go unnoticed. After a series transmissions where our anonymous transponder was repeatedly queried, much to Bric’s growing annoyance, we connected to a docking tube on the common level. As we entered the tube, Bric checked each belt and snap on his uniform, finishing with his sonic blaster. It was a ritual action he performed anytime he anticipated combat. Once complete, he stood up to his full height and pushed out his chest to appear larger and more intimidating. The first time I had seen him do it, I couldn't help but chortle a laugh; among my people this type of strutting was used only when initiating mating. “Let me do the talking,” Bric said, obviously wanting to take the lead, “you just keep your eyes open...and smile a lot.” One of the many nuances I had learned over time is that humans show amusement with a wide upturned grin, conversely we displayed it with an open mouth, tongue against the roof; apparently humanoids found this look to be threatening. Fortunately, watching Bric strut with his chest pushed out always made it easy for me to smile, especially when he approached other males. Making our way through a labyrinth of moving walkways, ramps, and lifts, we finally arrived at the common tier. Sitting on the port side of the plaza across from the ring, it was as incredible a waste of space as can be imagined. An open area filled with vendors and trade goods, more than three kilometers long and half as wide, with almost two kilometers of empty space above, its immense archways and fantastic architecture were breathtaking to view on scale that far surpasses any modern architectural achievement in the galaxy, none of which made it any less a massive waste of space. “Where do we begin?” I asked Bric since he insisted on taking the lead, it was possible to spend an entire week aboard a plaza and not see every part of it. Bric said nothing, offering me only a grin, and then ordered a driver to take us to section six-two-six. The intra-plaza transports are small, two or four passenger vehicles with three magnetic thrusters that derive their power from the energy field generated by the plaza itself. Like most furniture in humanoid space, they were not designed for one with my anatomy so I was forced to sit forward in the seat to allow space for my tail. This position had the advantage of giving me a good view of our driver, while Bric sat back and closed his eyes, likely daydreaming of capturing as elusive a criminal as Shileg Tal. While I would normally take these opportunities to examine my surroundings, I became captivated with our driver. I was fascinated with how he positioned himself on a small cushioned seat set into an austere metal frame that was meagerly connected to the passenger compartment. I watched as he placed his feet on posts and grasped the simple steering mechanism, which moved in two planes. Knowing that this transport would take flight, I was surprised to see he did not have even the simple seat belts that we had been afforded, which neither of us bothered to buckle. As I observed, I surmised that it would take a brave being to pilot these transports. The transition from rest to motion was so slight that had I not observed us leave the ground behind, I would swear we were still there. Our pilot banked and started towards six-two-six; the thruster situated beneath him seemed responsible for steering as its movements mirrored that of the steering mechanism. Amused with the simplicity of the vehicle, I continued watching as he maneuvered through the traffic, and we arrived at section six-two-six sooner than I would have liked. I transferred a few extra digits to him and thanked him for the ride. Forgetting myself, I smiled politely and thought the poor man was going to hurt himself as he stumbled backwards. Bric laughed aloud and patted me on the head, a gesture I had repeatedly asked him to discontinue. “Come on,” he said, completely missing the twitch in my tail that so clearly conveyed my annoyance, “I have a feeling we’re going to get lucky here.” Putting on a scowl and puffing himself up, Bric strode toward the tavern; after a moment I reluctantly followed. Shades of Gray had long been a well-known gathering place for smugglers and pirates, in addition my partner claims it carries the best corn whiskey in the galaxy. When we entered, all eyes turned to Bric as he drew his sonic blaster and pointed it at the bartender. "Melvin! A moment if you will." In the quiet that followed, I'd felt compelled to quietly remind him that “A.D. Morrell was very specific in his orders regarding the use of his weapon." “Just wait for it,” he retorted in a low tone, his lips briefly turned up into a grin. “No one here’s gonna talk to you Braun?” the bartender announced, a sneer on his face. My people express emotions in body language and pheromones, but humanoids have far more expressive features, as a result much of my early studies had involved reading facial expressions in humanoids. In all, I had found that reading these was far simpler in comparison and these studies have helped me in a variety of social and professional situations. In this case, I could see that Melvin was trying to display disdain, but a tick in his cheek and the way his eyes darted left told me that he was nervous about something. I doubted it was Bric, I've seen this situation play out many times between them. Remembering that I was supposed to be making a facial expression of my own, I forced a smile, the effect on those around me was immediate. I did not at first understand why humanoids had this reaction, until Bric had explained to me, quite innocently, that most believed that Saurians enjoyed consuming humanoid flesh. I was horrified, but must admit that playing to that fear has been useful on occasion. "Drinking on the job Braun. That's not very Marshal-like of you." "Neither is shooting you in the face, but that hasn't stopped me in the past." While Bric and Melvin had continued their verbal sparring, which I knew would go one for at least several more minutes, I searched the faces of those seated in the tavern. Ignoring those who appeared curious or annoyed, I paid close attention to those maintaining stoic and fearful expressions. Among humanoids, I had found that the stoic were most often trying to disguise their fear, while the fearful felt guilt for something. Making eye-to-eye contact with either could typically provoke a reaction. Of course, there are others ways to provoke a reaction. With a loud thump, one of the tables in the tavern turned over, glass shattering as the drinks crashed to the floor. Four humans jumped up with their weapons drawn; three of them aimed for Bric and one aimed for me. I heard the distinctive click of a cartridge falling into place and knew instantly that one of them was carrying an illegal weapon. “Grinder!” I shouted, ducking into a passage between the booths out of sight of the attacker aiming at me, though upon reflection, it is possible that I spoke the word in my native language as no one in the immediate area reacted as they should to my alarm. As I watched from my hiding place, Bric casually turned to face the four humans, puffing out his chest. “Put ‘em down, boys!” His bravado never ceased to amaze me; I expected to be identifying his corpse a little later that day. When they started firing at him, my partner rolled over the bar and took cover behind it, presumably next to Melvin. After the blasts stopped, I heard the unmistakable whine of the grinder. Again, I shouted “Grinder!" being sure to use the common language of Bandy. This time numerous patrons immediately hit the floor. I hoped that Bric had heard me and had managed to move before the weapon tore holes in the structure and shattered glasses and bottles atop it. At that moment, however, I couldn't worry about him, I needed to protect the patrons. One of the advantages of being about half the height of most humans is that it took little effort for me to move about unnoticed. Staying low to the ground, I made my way around them, glancing back over my shoulder when I heard Bric firing at them from a different position. In my peripheral vision, I saw Melvin attempt to scramble over the bar, but Bric grabbed him and pulled him back down as the grinder unleashed another flurry of shrapnel. I'd heard the gunmen making their way towards the only open exit at the front of the bar, and was forced to roll and leap as the furniture around me began to explode from the blasts. Few humanoids had any idea that my people are astonishing leapers; I made a twenty meter jump to the back of the tavern, landing lithely atop one of the tables. This put me behind the group; I could see that while the human with the grinder was focused on the bar, chewing up the structure and shattering any remaining glassware, the others were shooting at their fellow patrons, viciously clearing a path to the door. I shot that one first, as I did not have a shot at the one with the grinder. The one next to him foolishly began to turn, giving me time to easily put him on the floor next to his companion with a well-placed shot in the back. The third one took cover as I adjusted my aim. While I stood on that table sans any cover, my mind drifted to the old axiom that luck does not go in search of a fool. When the one who held the grinder stepped around a booth and brought the weapon to bear on me, I believe in that moment the word fool was stamped on my scaly forehead. The only thing I had going for me was that the man with the grinder did not aim it like a gun so much as he used it to sweep like a broom. I searched for a place to duck as shrapnel from the grinder chewed up glasses, bottles, paneling, pictures, shelves, and lights -- basically everything in its path towards me, until I found myself staring into its barrel. It was in that moment that its clip ran out and was ejected to the floor. Luck may not have sought this fool, but it had found me none-the-less. Bric had popped up and fired at the two humans a moment after I should have been shredded; one of them dropped heavily to the floor, the one with the grinder bolted for the door. I fired twice, both shots struck the wall and he was gone. "Her?" Human gender was so difficult to determine. "There are three perfectly good humans to question lying right here," I shouted as I chased my partner out of the mangled bar. I had known that my words were wasted because Bric would never allow anyone who had shot at him with a grinder go free, so I followed. Bric had been firing as he ran and more than one bystander fell to his wayward stun blasts. The streets cleared before us and I saw the woman whom we pursued jump onto a rickshaw and turn the grinder towards us. At some point in her flight she must have reloaded the weapon, because it again began spitting shrapnel in our direction. Once more, luck seemed to favor the foolish; the street had been cleared by my partner's blasts so that the grinder found very few targets and left little more than superficial wounds. In this instance, actions that A.D. Morrell would typically classify as reckless had saved lives. Bric would be very pleased with himself. While I leaped for cover behind a vendor cart, Bric dove to the ground and rolled away, somehow finding himself entangled with a young woman who did not appear to be unhappy with the situation. Though I managed a couple of shots from my position, the angle was not ideal and our quarry managed to activate the rickshaw and escape into the air. Ever genteel with the ladies, I heard Bric apologize while extracting himself from the female while offering her a compliment; together we then bolted toward the rickshaws. Our previous driver, perhaps happier with the number of digits I had provided than with my smile, waved the two of us to his waiting rickshaw. Little did he or I know that Bric had another plan in mind. From a distance I leapt into the passenger compartment, while doing my best to keep our gunman in sight, and shouted, “Follow that pirate!” pointing at our fleeing quarry. Bric ran directly to the driver, lifted him up, and tossed the stunned human into the passenger compartment. While tracking her direction, I had been struck by flailing legs and found myself knocked to the compartment floor. By the time I righted myself, Bric had mounted the pilot seat and the rickshaw leapt awkwardly into the air. “Find her Ruh!” Bric called back to me, dodging traffic. While the flight lanes in the plaza may have been well understood by local pilots, Bric was not one of their noble breed. We quickly found ourselves weaving in and out of oncoming traffic, coming perilously close to a lethal collision more times than I'd care to recall. To his credit, Bric managed to dodge and weave his way through it like an expert, even if his erratic maneuvers tossed myself and our driver mercilessly around the passenger compartment, making my task to locate our quarry all the more difficult. I had finally managed to right myself and scanned the last direction I'd seen her heading, while holding on as best I could. The task was exactly as difficult as it appeared. “Ruh, do you see her?” Bric’s voice held a tone of desperation. Following my direction, Bric managed to quickly locate her; his eyes narrowed and a small grin touched his features as he punched the thrusters. Our rickshaw leapt forward throwing me painfully back onto the seat. Amid hard banks and rapid rises and drops, I managed to climb into the seat to strap myself in, while our driver, a man I had at once thought to be brave, held onto the armrest and screamed like a scared child. The noise was rather annoying. He did not respond, and had likely been unable to hear me over the whine of overworked thrusters and irritating screams of our driver, whose white knuckled grip on the edge of the seat was beginning to pull the padding away from the frame. I stared at the bare frame for a moment, before cursing myself for being simple minded. Dropping back down onto the floor, I used my talons to slice through the seat cover over the area in which my pistol was lodged, and then began ripping away the the padding. If the expression on our driver's face had been any indication, I must have looked mad, tearing away handfuls of the stuff and throwing it out of the compartment. “I’m comin’ up on him!” Bric shouted. I tore harder at the padding, digging through it for my blaster. “What the hell are you doing?" the driver shouted, "This is my livelihood! Are you gonna to pay for that?” These and other rhetorical questions and statements continued to explode from his mouth while I dug, along with a series of insults aimed at my lineage. Admittedly, I was relieved that he was no longer screaming like a child. Tearing through the bottom covering, I could finally see my pistol. Luck finally abandoned this fool; the blaster was entangled in several springs that pinched and pulled at the scales on my arm as I reached for it. Pulling it free was not much easier, and the feeling of accomplishment that swept across me was short lived as Bric had nearly rolled the rickshaw onto its side making a hard turn, throwing me back onto the floor. Now that he wasn't screaming in terror, our driver made himself busy by shouting insults at Bric. I took a deep breath and quieted the twitch in my tale; the driver was adding unnecessary stress to an already intense situation, so I pointed my pistol at him and fired. Of course, Bric had selected that exact moment to see what all the commotion was about. Our eyes met and he grinned. I hung my head, wondering if I would soon be standing defiantly in A.D. Morrell’s office taking the full force of his rage. I hoped not. I looked up and saw that we were near one of the massive archways; our quarry had apparently realized our approach and was attempting an escape to the hangars. Bric had managed to stay on her, but at a distance that made our weapons useless. Pushing the rickshaw well beyond its limits, Bric managed a series of high speed maneuvers that had nearly rolled our vehicle on numerous occasions and forced me to holster my pistol to hold on with both hands. During the insane flight through the upper regions of the arch, Bric had steadily begun to close on our quarry, continuing to make headway as we dove along its edge, and plunged once more into the traffic around the common tier. The thrusters had reached a point where they would soon overheat if not explode, but that didn't stop Bric from punching at the speed controls as he vainly tried to coax it to go faster. We were within about fifty meters, but our weapons had a maximum range just over half of that; this chase needed to end before our quarry realized that we were well within the range of her grinder. The rickshaw had lurched into a climb and several holes appeared in the bottom of the compartment, one very near to my leg. We then dove, and I could see her attempting to take aim with one arm and steer with the other. She very nearly lost control and to my great relief, the grinder tumbled from her grasp. The failure cost her weapon and some speed. Bric shouted out a "Woop!" as we closed in on her. Growing desperate, our quarry turned into one of the middle levels; much to my horror, we followed. Store fronts and vendor carts raced past in a blur. The passage in which we flew was barely fifteen meters from bottom to top; the rickshaw was nearly scraping the ceiling while the people below us screamed and ducked as we skimmed over their heads. Bric had closed the pursuit distance to less than twenty meters, but I didn't have a clear shot at her thrusters from this pursuit angle and blasting her would cause a crash into the waves of people below us. I had no intention of being responsible for so many deaths. I cannot possibly state this with more confidence, corridors are not meant for high speed cornering in any vehicle, let alone a rickshaw. Throughout the series of hard banks in that labyrinthine level I had this image of Bric missing a turn and us ending up splattered on a wall. When we finally came to an open area, I set my feet as best I could and fired at our quarry; Bric's maneuvers threw off each shot and I may have inadvertently hit a bystander...or two. That was probably not going to go well for me. Trying to be more careful, I fired two more times. One shot hit the rickshaw and the other struck a bot vendor sign, scrambling their pricing structure. It appeared that there was going to be a sell on bots on six-two-six. I braced myself with my forearms on the edge of the compartment and took a deep breath. Bric was trying to herd her, presumably into a dead end, so this shot would be vital to putting an end to this chase. As we approached the junction, I could see people milling around the panel; A.D. Morrell was not going to be happy about this. I aimed and pulled the trigger as fast as I could as we approached. My blasts felled four bystanders, but also struck the panel, unleashing a shower of sparks. Our quarry saw the blast door dropping and abruptly changed direction. She struggled to make that turn, briefly showing us the underside of her rickshaw; that was all I needed. The last three sonic blasts in the power pack issued from my pistol. The first struck the undercarriage to no effect, but the second and third hit her starboard thruster causing the rickshaw to drop lopsided and slow significantly. I expected that Bric would slow as well, and use our rickshaw to force our quarry to the ground. My partner rarely did what I expected, this time was no different. Maintaining full speed, he rammed her rickshaw and used the momentum from the collision to leap from his perch, making a flying tackle. Up until that point in my life I had seen many amazing things, but only two of them had left me utterly stunned, diving into the black hole was one, and this collision induced flying tackle was the other. Together Bric and our quarry skidded across the ground, bowling over several people and sliding to a stop in the center of the corridor. After the collision, the passenger compartment of the rickshaw broke away, sending myself and our driver careening towards a store front. I had visions of splattering against it, but once again luck saved this foolish Razi. Braced for impact, I crashed through the window of an Alternative Gravity Therapy Clinic and found myself floating in a zero-g field. It had taken me moment before I realized that I was not dead and then was forced to push-swim my way out of the field amidst a sea of shocked glares and shouts about the broken window. When I made my way back outside I found that our driver was still safely secured to his seat, to my great relief. “Bric? !” I called out, searching for my partner. A short distance away, I found him and our quarry facing off in a duel. The pirate wielded a shockfoil--a charged rapier whose electric hum rose and fell menacingly as it swung back and forth--and Bric held a pulse baton--a much shorter, club-like weapon capable of transmitting a powerful neural charge intended to stun its victim. Between the difference in type of weapon and her obvious degree of skill, Bric was at a definite disadvantage. His blaster was not in its holster and I did not see it in the immediate area. Having lost my pistol somewhere in the crash, I dashed into a nearby shop. The shop owner shouted, “No Saurians!” I had encountered such prejudices times too numerous to count; it had been difficult to ignore at first, but had slowly become something I barely noticed. Instead, my attention was drawn to an energy-lance mounted on the wall over the counter. These foil-like weapons were a meter and a half long, with a full third of it taken up by a massive hilt that combined power pack and generator. Popularly used in gladiatorial games where the polarized blade crashed and sparked on every impact, a strike from it would cause limbs to go numb and could temporarily incapacitate. While I had only rudimentary experience with it, I had seen Bric spar with one often and had yet to see him lose. “I will take this,” I said, leaping onto the counter and pulling it from its place. 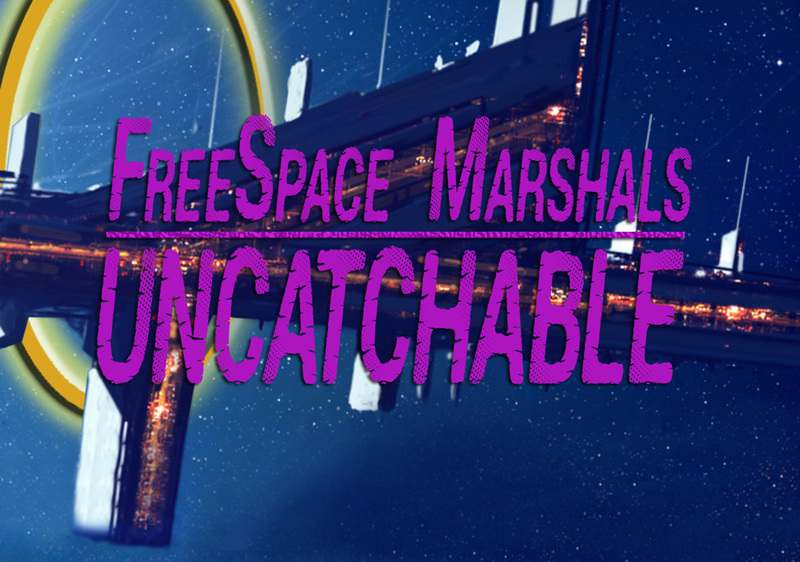 “Please send the bill to A.D. Morrell of the FreeSpace Marshals.” Why not, he was already going to be angry with me. The merchant either did not believe me or was unwilling to wait for payment, and so attempted to bar my way. Not feeling an abundance of sympathy for him after his prejudiced outburst, I activated the blade and touched it to his chest. He crumpled to the ground, adding another to the long list of things for which I was going to be held accountable on this mission. The smile I wore dropped as I rushed back into the corridor to find Bric, now weaponless, barely evading a thrust and retreating away. Knowing that Bric would not last long on his own, I ran forward and leapt, vaulting myself nearly thirty meters, and shouted, “Surrender pirate, you are outnumbered!” They both turned; the pirate acted quickly, ducking my stroke while swinging her shockfoil and striking me on the leg as I passed. Both I and the energy lance crashed to the ground. I could smell seared scales and most of my body was tingling, but I remained conscious. During my time with the Marshals, I have been struck by sonic bolts, pulse batons, energy lances, and a variety of other non-lethal coercive weapons, but none of them had been as painful. I wanted to scream out, but did not want to give the pirate the pleasure of hearing it, so I bore the pain quietly. Rolling over, I was able to shift my position enough to see that Bric had picked up the energy lance and was now advancing on our quarry. A crowd of onlookers had gathered in the area; this was not good as the people of Falleon were not known for their love of the Marshals, so if Bric were lose, I doubted either of us would escape with our lives. “I’m going to put an end to you, Braun,” the pirate said as their blades clashed in a shower of sparks. “Many before you have tried, including ex-partners, ex-lovers, and superiors,” Bric retorted, wincing away from another shower of spark, "but I'm still here." They once more exchanged parried strikes, from my perspective on the ground, I could see the pirate was being pushed backwards and her once confident step and style had become erratic. Within the circle of spectators a series of cheers and profane comments erupted, though I much of it seemed to be noise consisting of shouted gibberish. Bric paused as the pirate retreated away a couple of steps. I noticed the discarded pulse baton near my partner’s foot. “Time to end this,” he said, taking a partial step back as if winding up to rush forward. The pirate set her feet, ready for the rush. They stared at one another for what seemed like an eternity, Bric daring her to run, she daring him to attack; the spectators had gone deathly silent. The pirate lowered her shockfoil for just a moment, perhaps stunned by the revelation, and Bric kicked the pulse baton. With her weapon out of position, the pirate had no time to parry the baton flying at her waist, and so he reacted quite naturally, reaching out to catch it with her off hand. When the end of the baton struck her open palm, a distinct pulse of blue light erupted and Shileg Tal crumpled to the ground. I smiled, not caring if I scared any of the remaining spectators, and did manage to stay on my feet as Bric cuffed our quarry. “How did you know?” I asked, pointing towards the pirate. “But you do that all the time,” I observed.